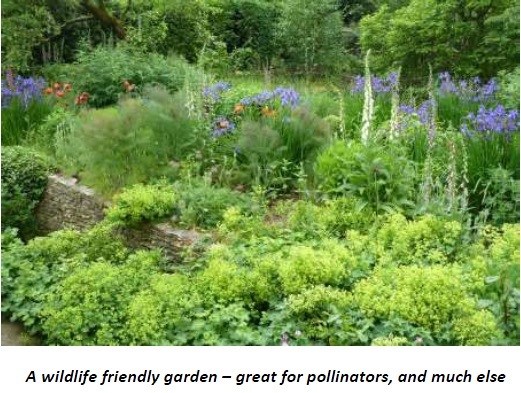 For more than ten years The Bourne Conservation Group has been striving in a practical way to provide better habitats for wildlife in public open spaces such as the Middle Bourne Lane Community Garden and the Old Bourne Churchyard. Although these have been successful projects their impact is small when set against the whole area of Farnham. We have therefore always encouraged visitors to adopt some of the ideas and practices apparent on these sites in their own gardens. In parallel, triggered by work on Farnham?s Neighbourhood Plan, we launched a survey to try to find out more about the content of the town?s gardens which make up a quarter of its area. 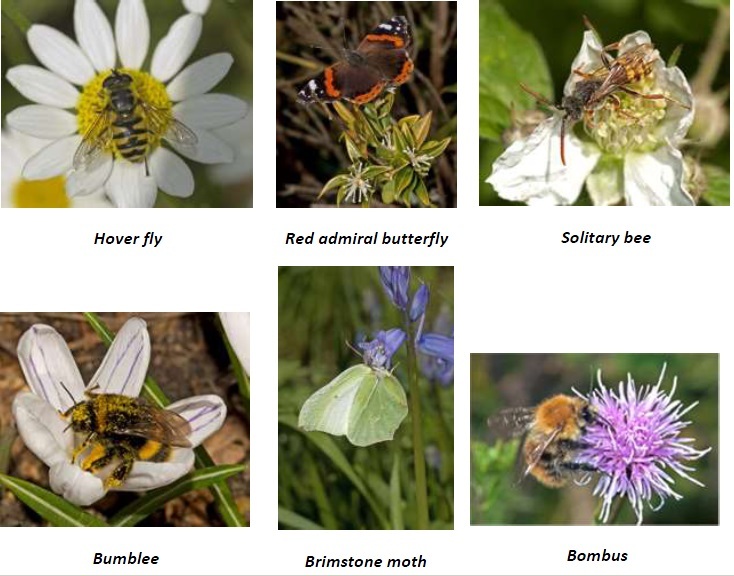 In view of this background we are delighted that the new Mayor of Farnham, through the Farnham in Bloom campaign, is urging residents across the town to do what they can to encourage wildlife in their gardens, especially pollinating insects, some of which are shown below. We believe the combined impact of the contribution made by many gardeners across the town would be considerable. However, because every garden is different in size, content and character, gardeners will need to tailor their actions to their own individual circumstances. In many cases small, quick improvements will be effective, while in others longer term measures may be more appropriate. Such innovations need not cost a lot of money and should be relatively simple to put into practise. For example, in our survey it was surprising to find that many people do not have a compost heap. By introducing one, not only can money be saved by reducing the need to purchase compost, but habitat will be provided for useful animals such as slow worms and toads that eat many garden pests (including slugs). Another cost and labour-saving example is to stop using chemicals on lawns which kill off everything except the grass. A more natural lawn in which buttercups, daisies and clover are tolerated is much more interesting and it is amazing to see how bees and other pollinators love those simple plants. Here is our Top Ten menu of things to choose from that might suit particular gardens. Make water available. Water is vital to the wildlife in your garden whether it be in the hot summer or the freezing conditions of winter. This is especially relevant in The Bourne Valley where the stream is dry for several months in summer. A simple birdbath is a good start point but some may wish to go further, in which case having a pond is the number one way of enhancing the wildlife in your garden. Retain an area of long grass. Even if you want to keep your lawn in pristine condition, setting aside one area which is left uncut will help pollinators, give shelter for small mammals and frogs, and provide seed heads for birds later in the year. Set aside a wild area. Many gardens will already have a ?forgotten? corner where all those bits and pieces of unused garden materials accumulate. This will provide shelter for wildlife but its value can be enhanced still further if you let a few stinging nettles grow there. These will support the caterpillars that miraculously turn into Red Admiral and Peacock butterfly pollinators next year. Other wild plants that are of immense value are brambles and ivy. Make a habitat pile from logs, twigs or stones. Every garden generates large quantities of superfluous material much of which can be retained to advantage. Piles of logs of all sizes from twigs upwards will be helpful to insects and beetles as will piles of those stones that you take out of your flower beds or vegetable patches. Note. Just as your garden as a whole needs care and maintenance, so the small wild patches suggested here also need some management if they are not to be taken over by tree saplings, coarse grasses or other aggressive plants. Get composting. The value of making your own compost has already been mentioned above. The product can be spread on the garden to help mulch and feed the plants, and the compost pile itself will support a variety of wildlife. Leave some bare soil. Much of Farnham is hilly and, if you have a sunny bank in your garden, clear a patch of all plants to just leave some bare soil. Many solitary bees (which do not sting) nest in burrows in such areas. Choose a hedge rather than a solid wooden fence. The advantages to pollinators and other wildlife of a natural hedge are readily apparent. It is also much more attractive for you and those passing your property. In cases where a solid fence is considered essential, do leave some gaps at the bottom to allow hedgehogs and other animals to go foraging.